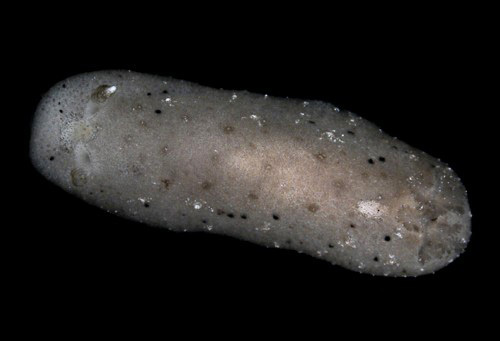 Identification: This is a slender, gray dorid with widely spaced papillae tipped with light brown, dark brown or white. Natural history: Paradoris sp. #7 is known from a single animal found at a moderately exposed rocky site at a depth of < 7 m (< 23 ft). Distribution: Maui: possibly also known from Japan. Taxonomic notes: First recorded in Hawaii from Mala Wharf, Maui by CP on Nov. 21, 2000. Photo: PF: 12 mm: found by CP; Mala Wharf, Maui; Nov. 21, 2000.